What is Kinesio Tape and How Do Chiropractors Use It? 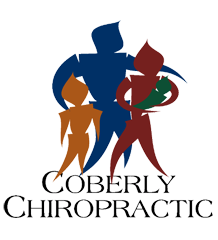 – Coberly Chiropractic, Inc.
You may have seen professional athletes, dancers, gymnasts, and others who engage in extremely physical activities using a type of tape on various points of their bodies. It is sometimes colored and does not seem to inhibit range of motion. While it looks like tape, or maybe a very fancy bandage, it is actually a highly technical, specialized tape that is used to treat patients of all ages and activity levels. It is called Kinesio tape and it is often used by chiropractors to help treat certain injuries. Also called Kinesio Tex Tape, Kinesio Tape is a special adhesive tape that has elastic properties. It was developed by Dr. Kenzo Kase, a chiropractor and acupuncturist, in 1979. It is safe for all ages including pediatric and geriatric patients. The tape is comprised of a 100% cotton fiber strip with medical grade acrylic adhesive. It is soft and gentle, but it works. The tape is hypoallergenic and latex free so it is appropriate for a very wide audience. It is also water resistant, making it wearable for many activities. When worn, the tape does not limit or inhibit range of motion and the same tape can be worn for several days without losing its effectiveness. The tape can stimulate or relax muscles, depending on the tension that it puts on the body when applied. When worn, it lifts the skin by microscopic increments which aids in lymphatic drainage. It also helps to decrease inflammation and swelling which reduces pressure in the area. This allows the blood and lymphatic fluid to flow freer and more effectively in and out of the affected area. The Kinesio taping method is a systematic, therapeutic technique that offer a two-prong approach of supporting the patient and rehabilitating the condition or affected area. It can alleviate pain reduce swelling, providing relief to the patient. There are specific taping shapes that are specialized to address certain areas of the body as well as certain conditions. While it provides stability and support to the body’s joints and muscles, it does not restrict the range of motion. The technique is designed to address soft tissue injury by manipulating that area and facilitating healing. What Conditions is Kinesio Taping used to Treat? Athletes may also use it for additional support or to prevent injury. Because it relies on the body’s own natural healing process, many people find it to be preferred treatment for many painful conditions. When combined with chiropractic care, Kinesio Tape is very effective. When treating a condition with Kinesio Tape, the chiropractor may use a variety of techniques, depending on the illness or injury. They may use spinal manipulation, massage, and other treatments, combining them with recommendations for lifestyle changes and diet modifications. The draw for this treatment is that it encourages the body to heal itself, eliminating the need for drugs with their undesired and unpleasant side effects, or more invasive treatments like surgery. Kinesio Taping is safe, natural, and a perfect complement to chiropractic care.